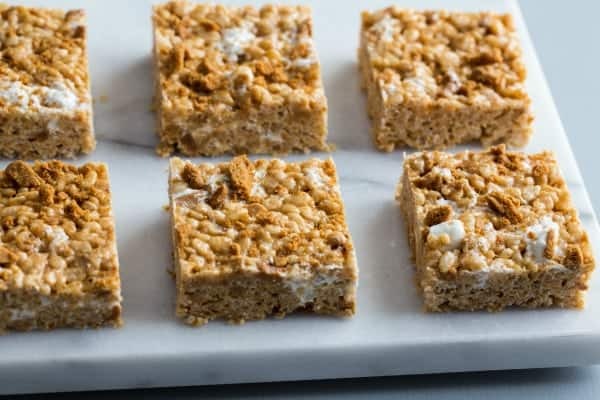 Crispy crunchy Biscoff Marshmallow Treats may be my very favorite version of that cereal snack. You’re gonna love ’em. This is a sponsored post on behalf of Campfire® Marshmallows. Thank you for continuing to support the brands that make My Baking Addiction possible. Oh, guys. Moving is the pits. I feel like we’ve been doing it forever. Which, if you take into account having to piece-meal it together because of the holidays and a toddler, we have been. Our new house is coming along, but there boxes everywhere and toys scattered throughout the chaos (oh, did I mention baby girl had a birthday in the middle of all this and got ALL THE TOYS as gifts? ), and I’m staring down the fact that my kitchen and photography props have to be unpacked in a super hurry, which just stresses me OUT. Right before we moved, I made these amazing Biscoff Marshmallow Treats. 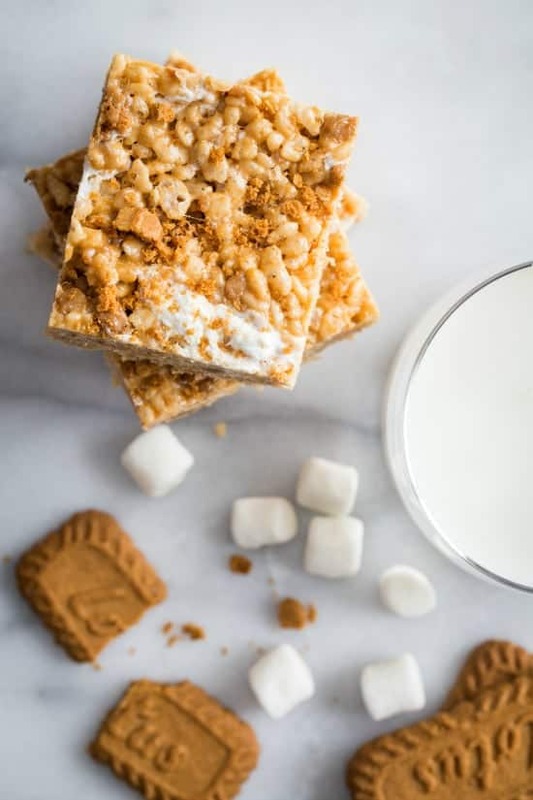 With crispy crunchy Biscoff cookies, creamy Biscoff spread, and perfectly melted, sweet Campfire® marshmallows, they are indeed as delicious as they sound. The great thing about these Biscoff Marshmallow Treats is that they’re no-bake. All I needed was a big saucepan, a spatula, and a casserole dish to get me where I needed to be – Snacktown heaven. To make these treats, you’ll start as you always do – with the best marshmallows in the land (Campfire®, duh), and butter. As it all starts to melt, you’ll mix in creamy Biscoff spread. Once that’s all ooey gooey goodness, you’ll add chopped crunchy Biscoff cookies and rice cereal. 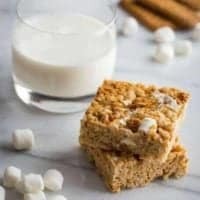 If you want to get big chunks of marshmallows in your treats, you can mix extra ones in with the cereal and cookies too. 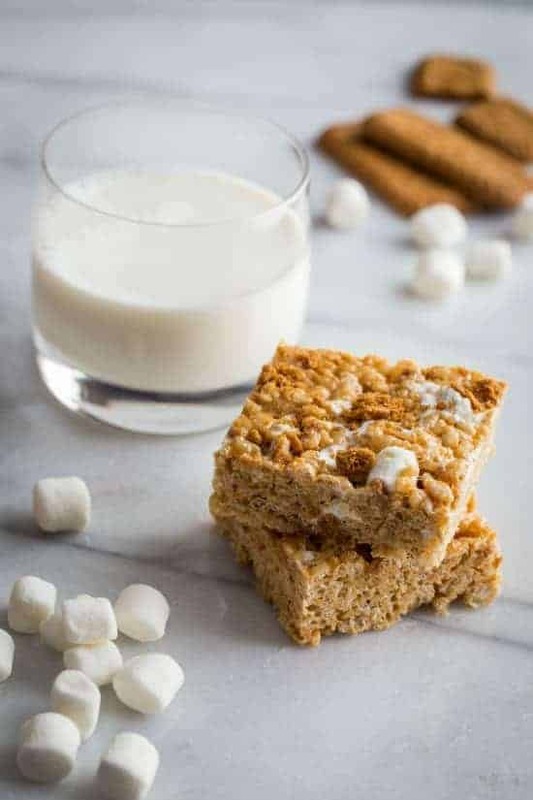 There’s not much better than biting into a crispy, crunchy rice cereal treat with both cookies and ooey gooey Campfire® marshmallows. As you may remember from my Strawberry Marshmallow Fudge, I’m thrilled to be teaming up with Campfire Marshmallows again in 2015 to bring you a year of exciting, seasonal, and delicious recipes. We even created a Marshmallow Madness Pin Board where we’ll pinning all of our favorite marshmallow recipes from our favorite food sites. 2. In large saucepan melt butter over low heat. Add in 5 cups of marshmallows and stir until completely melted. Add in the Biscoff Spread and continue stirring until the mixture is smooth. Remove from heat and stir in vanilla extract. 3. Add crisped rice cereal; stirring until well coated. Fold in the chopped Biscoff cookies and remaining 3/4 cup marshmallows. 4. Using a buttered spatula, press the mixture into the prepared pan. Cool. Cut into squares. These would be good with peanut butter! Thanks so much for visiting. What a great idea! I love that Biscoff spread. I once tried to make fudge from it, which was a complete disaster. These, however, look amazing! I hate it when a brilliant idea doesn’t quite turn out in the kitchen! Thanks for visiting! I made Rice Kriespie Treats with Amarettini a few days ago.. I guess it tastes kinda similar.. don’t you think? Anyway.. I loved it!!!! SO I bet these are amazing too. I think the Amarettini cookies would be a great trade-out. Thanks so much for visiting! What is Biscoff spread and cookies? Any alternative? Would love to try these. Biscoff spread is also called cookie butter and can usually be found near the peanut butter in grocery stores. It has a flavor similar to graham crackers as do the cookies. I hope this helps. Hi, Helen! This site ought to help you out with the conversions: http://calculator-converter.com/converter_g_to_c_grams_to_cups_calculator.php. Let me know if you need anything else! With what can substitute the spread with? We dont get it in South africa. Hi, Lydia! Here’a a recipe for Homemade Biscoff Spread. I haven’t tried it, but it may work for you. Let me know how it goes! I did these with the cookie butter Oreos. Next level! That sounds AMAZING!!! Happy Holidays to you and yours!